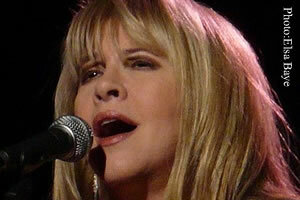 Singer Stevie Nicks will be featured on the premiere episode of a show about gay icons, Reuters reported. MTV Network's gay channel Logo will pay homage to the Fleetwood Mac singer/songwriter in a new series of specials called NewNowNext Icons. NewNowNext is the channel's ongoing look at queer music, gay artists and culture. The show will feature music videos for such tunes as Landslide, Gypsy and Stand Back and interview clips with Nicks, who has sold more than 120 million albums. The sixty-one singer shares her thoughts on why she has been embraced by the LGBT community, her inspirations, and future projects, Logo said. NewNowNext Icons premieres July 19 on Logo at midnight EDT/PDT.